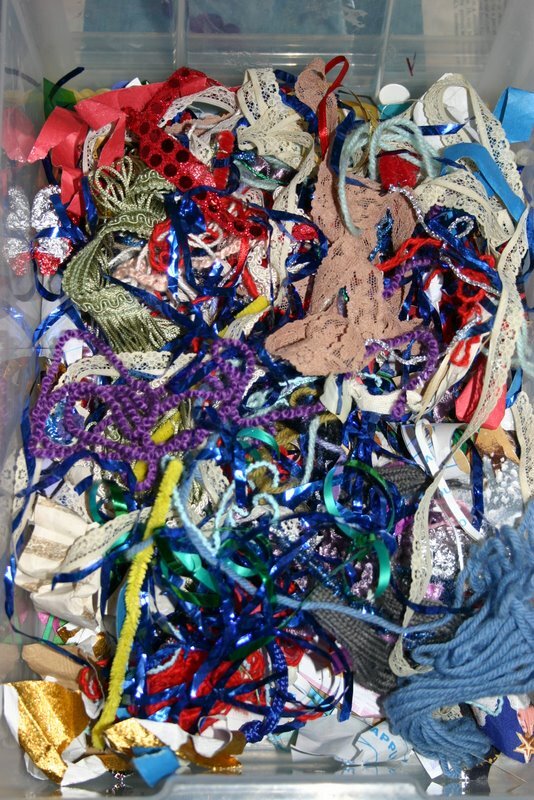 There is a lot to be said for a beautifully organised and sorted collage tray. All those colourful pieces just waiting to be used in so many creative ways are so attractive to toddlers and preschoolers; in fact children of all ages. 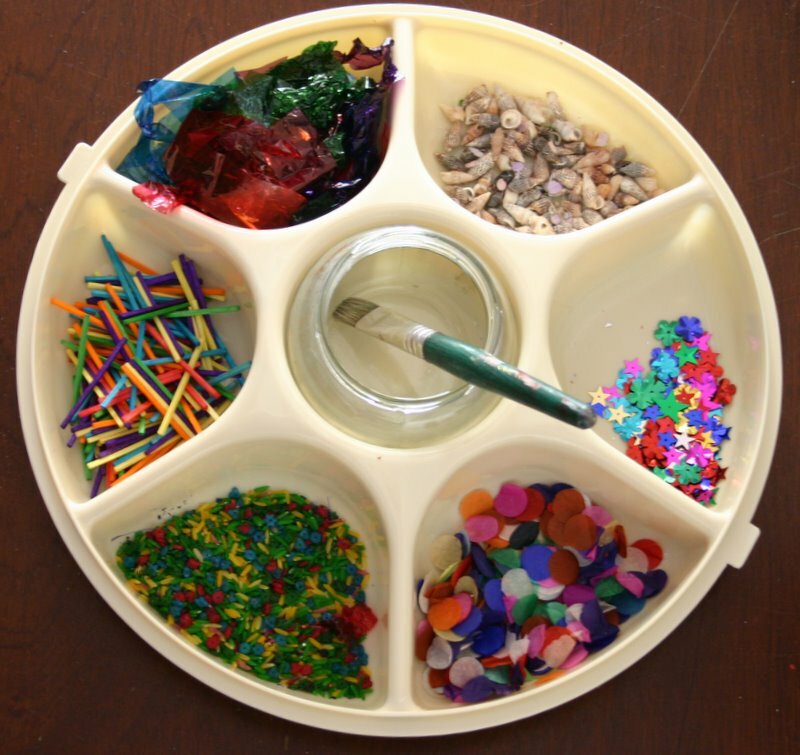 One of the easiest ways to keep collage materials sorted and ready for gluing is a party dip platter like the one in the photo above. The compartments hold a number of different materials for children to choose from and the lid slots on over the top and seals with a turn to stop all those bits and pieces ending up on the floor. This tray was $4 at a recycled boutique (Good Sammy’s) so keep your eye out in second-hand stores and swap-meets or perhaps even Grandma’s plastics cupboard. I use the centre space for a jar that is filled with glue and re-sealed with it’s own lid once the activity is finished. If you include items like pasta, fabric and shells, make sure you include white glue (PVA) or children will be continually frustrated with pieces falling off their craft. Glue sticks are less messy but really only useful with paper and cardboard. I personally am attracted to the organised collage style, however after an activity day at our local park a couple of years ago I had my eyes opened to the world of what I like to think of as “bargain bin” style gluing. You know the clearance bins they have in the shopping centres with a jumble of odds and ends for bargain basement prices? The ones that scream at you to have a search through because you just might find the bargain of the century lurking underneath the pile. The collage they put out at the park day worked just like this for the children. It was simply a box of assorted stuff in one giant jumble. You should have seen them hunting through it like treasure seekers. They scrabbled happily through, exclaiming with delight when something new and sparkly was discovered. They seemed to have a bizzare attraction to the jumbled assortment of goodies and enjoyed the gluing just as much as when presented with my neatly sorted dip tray. Consequently, we now have both. When the dip tray gets jumbled and messy, I simply tip it all into a small crate with a lid and re-fill the compartments in the dip tray with new materials. That way both collections are continually changing. put a plastic tablecloth, gluing mat, placemat or newspaper on the table before they begin. wear a painting shirt, smock or apron. wash the brushes after use and return to their place to dry. place wet pictures and crafts in an appropriate place to dry. return the tray to the cupboard or shelf. wash themselves up before removing their painting shirt. hang their painting shirt up to dry. Excellent.. You’re such a great teaching mom! I wish I had done more this way. I do believe it is never too late and my LO learned a lot of this in her daycare Ctr thank GOD. Thank you for sharing. I have so many ideas! Never too late! I put gluing out during the holidays and everyone from the toddler to the 9 year old had a blast gluing random pieces to Easter egg cut outs.